EMC is participating in Offshore Mediterranean Conference & Exhibition OMC 2017 in the period from 29th till 31st in Ravenna, Italy. EMC has appointed by EGPC to represent among other EGPC companies the Egyptian Oil & Gas sector, it's a great opportunity to EMC to join more than 600 private and public countries from 33 countries and more than 12000 visitors in the first day from all over the world to strengthen the business relationships and find new projects and opportunities. Worth mentioning that EMC Chairman & CEO Eng. Wagih El-Gishy welcomed his Excellency Eng. 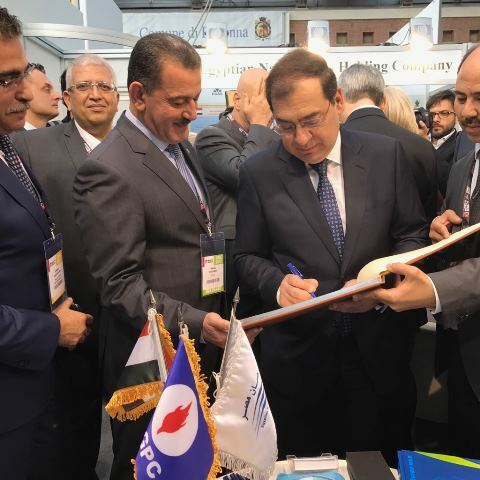 Tarek El-Molla Egyptian Minister of Petroleum & Mineral Resources at EMC stand inside the Egyptian Ministry of Petroleum Booth who wished all Success & Progress for EMC and our country Egypt in the first day of the event. OMC Conference & Exhibition is being held every two Years in Italy and targets all the Mediterranean countries since its first launching from 22 Years.